A wedding ring symbolizes the long lasting love and commitment of the couples. It will be the most enduring jewelry pieces of the wedding day. Hence it is important to choose jewelry that is timeless and high quality. If you are thinking that it is only the bride’s ring that would be in spotlight, then you are wrong. These days men’s wedding rings are making a huge trend with many grooms seeking unique wedding rings. Novori offers exquisite collection of men’s wedding rings and bands which will surely hold the attention of anyone who sees it. You don’t have to stick to the traditional wedding band. 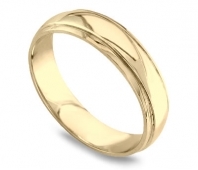 Browse through Novori Jewelry and you would find that there a plethora of marvelous men’s wedding rings out there. Coming a long way from the traditional platinum band, the diamond wedding rings have become the new craze. Men’s diamond ring reflects the trend by showcasing a range of gorgeous small diamonds or a single showpiece gemstone. Quite dissimilar to the ladies solitaire rings, the gemstone on a man's diamond wedding band is not raised on a prong setting but embedded within the flow of the band. Hence designer and fancy styles have become the most popular in this category. Yellow gold or white gold best compliments the diamond rings as both would project the sparkle of the diamond. 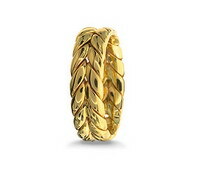 There are designs that incorporate both the metals into one ring. They are more wallet friendly than platinum. If you are seeking something unique, designer wedding band should be your pick. Designer rings would allow a couple to exquisitely express the strength of their bond with unique rings that shows off their creativity. Designer wedding ring can be custom made to look like exclusive brands without the huge price tag. Novori can custom make a design for you based on our existing ring designs or something you create. 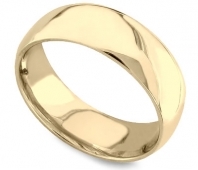 The ring can be modeled with luxurious metals, detailed cut and gorgeous designs. The ring on the groom’s finger will surely look gorgeous without a hefty price tag. Novori Jewelry offer classic and contemporary style of custom made rings that can make a unique personal statement. Furthermore you can make a powerful statement of your union with your beloved by opting for a fancy wedding band. Make sure that you are adapting the latest trends by incorporating personalized designs within luxurious metals of white gold and yellow gold for a budget friendly finish. The 14k white gold diamond wedding band and the palladium and yellow gold dual metal grooved diamond bands at Novori Jewelry are sure to radiate the charm.